Hope everyone is having a restful Thanksgiving weekend with family and friends! Today's pick of the week is this gorgeous charmeuse full-length gown, Dessy Collection's Style 2795. Charmeuse is a luxurious fabric that is softer than satin and has a supple feel and shine. The strapless cut with empire waist bow is a classic style that will stand the test of time, unlike those puffy sleeve dresses from the 80's. I suppose the pouf sleeve trend is back recently, but hopefully not for bridesmaid dresses! The dress grabbed our attention during our Spring 2010 photo shoot and it's been a favorite ever since. 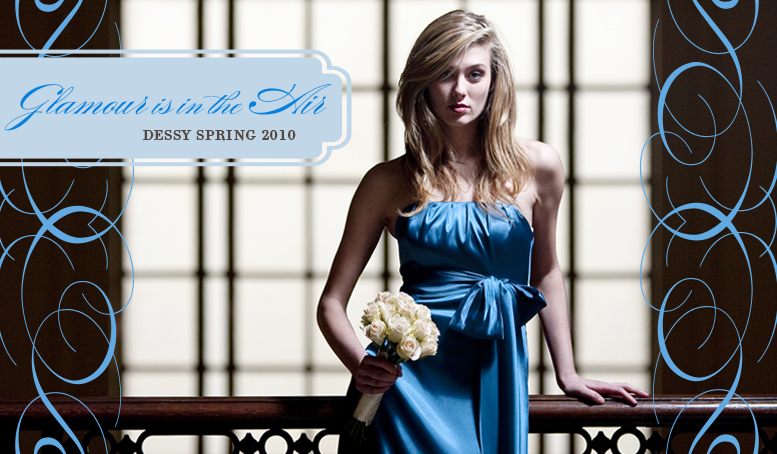 Here's a blast from the past of our model posing in the Beaux-Arts style Hoboken terminal, which by the way, is a great place to take engagement or wedding photos if you live in the area. Introducing our first "Pick of the Week"